Oliveira and Osorio play superbly. There is no surprise in that, nor in their mostly mainstream approach to Brahms. These are interpretations performed in a powerful, at times aggressive way. This bold and assertive style is the required norm for the Sonata No. 3, and while Oliveira and Osorio do nothing unorthodox --- nothing so combative as is found, say, on Pamela Frank/Peter Serkin recordings. Even so, there is an extra helping of dynamism to this sonata that is most effective and exciting. In the restrained and pensive Sonata No. 1, Oliveira and Osorio do less with rubato and adjustments to pulse than do the poetic and restrained Suk and Katchen. The consequence is a rather rugged interpretation that shows more of the work's links to its sister composition, the Violin Concerto, op.77. The most opinionated interpretation here is the Sonata No. 2, which is heated, emotive, high in dynamic contrast, and soaringly lyrical, to the point of being at times edgy and mettlesome in the second movement. I happen to prefer this kind of sharply defined approach to the work rather than the dreamy or soft-edged style nicely exemplified by the Almond/Wolfram account. Others may feel Oliveira and Osorio are contrary to the music's nature, but for me their Sonata No. 2 is a highlight to a satisfying and well-played account of the three sonatas. The sound is slightly distant, favoring neither violin nor piano, and indeed capturing some of the sense of being in a real hall at an actual concert. These readings are tasteful, well paced, and suave. Oliveira has wonderful control of the violin and plays with a fine sound and impeccable intonation. Osorio is a fine partner who matches all of Oliveira's nuances and keeps the music moving ahead with real rhythmic stability, especially in the sections that are rhythmically complicated. There must be over fifty different recordings of the Brahms; D minor Violin Sonata alon in the catalogue, beginning with Isole Menges and Harold Samuel in 1929 (on Biddulph if you can find it though it's on an Italian pirate label as well). But there's always room for an intelligent and tonally vibrant set, such as Oliveira and Osorio provide. IN the first movement of the G major it is instructive to observe how the prefer expressive and emotive shading to more obvious metrical displacements and temp changing. This imparts a seamlessness to their performace if perhaps at times a rather unyielding one. Osorio is on fine form in the Adagio, weighting his chords aptly and Oliveira catching the glinting, shifting profile of the violin's line. The finale is steady, Oliveira playing with soaring caution, bringing the m ovement to a peak of lyrical intensity at 5.30 with some dramatically urgent and opulent tonal resources. They're not as taut here as the famous oft-quoted Suk-Katchen duo but are strongly convincing on their own terms. The difficult Second (difficult because it's hard suiccessfully to convey its sometimes elusive meaning) receives a dramatic interpretation. This is strong on luscious tonal expressivity, strongly etched and committed, a very exterior traversal. There's much variation of vibrato usage from Oliveira and also some pungent chording from Osorio. In the slow movement in particular Oliveira digs into considerable reserves of lavished intensity, utilising the arsenal of devices open to a tonalist of stature to inflect and deepen the line. The gracious finale still has in their hands a steady, cumulative power to it. The D minor once more exemplifies Oliveira and Osorio's drama and power-laced aesthetic in these works. The Allegro is strong and powerful, the Adagio structurally acute, Oliveira reserving emotive intensity for the optimum structural moment, which is not -- pace certain well known fiddle players -- to early. He manages t6o highlight lyric phrases adeptly and is not inclined to use his vibrato as a sauce. The third movement is elegant, wistful with just the right note of lightness and movement, the finale strong and courageous. 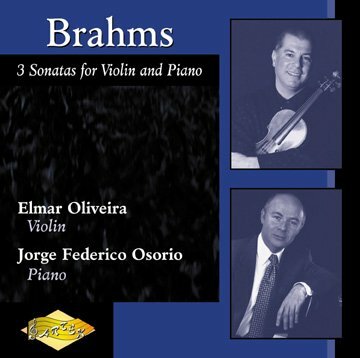 I am drawn to these performances by Elmar Oliveira and Jorge Federico Osario by some of the same qualities that draw me to Brahms's music itself -- a natural balance between passionate expression and Classical restraint, and a charm that is all the more touching for being so bittersweet. Oliveira and Osario don't prettify Brahms; in the vivace sections of the second movement of the A major Sonata they offer not the lilting delicacy one often encounters here, but a sense of purposefulness, as if the composer were smiling through gritted teeth. The musicians convey the unique personality of each sonata, too. The First is essentially reflective, with leisurely tempi and expansive phrasing, while the Second is lyrical, though not overly sweet. (Note how, in the first movement of the latter, Osario concentrates more on the long line than on underlining the strong rhetorical statements.) The Third, on the other hand, is exceptionally dark and weighty; Oliveira and Osario evoke a quasi-symphonic heft.